Terry Jones’s book ON Innovation counters the management-book tradition in which empty slogans too often take the place of actual thinking, Jones returns our attention to hard won insights learned from creating 10 startups and working for some of corporate America’s best mentors, and he does so with a light hand and a wry sense of humor. You’ll come away from this book enriched, even if you just only dip into it in 10-minute snatches now and again. "Terry Jones is that rarest of business leaders: a mature entrepreneur and a pragmatic visionary. When he offers lessons on how to spark innovation, his guidance is deceptively simple and easy to digest -- but steeped in the wisdom of one who has created real value and built enterprises that last." 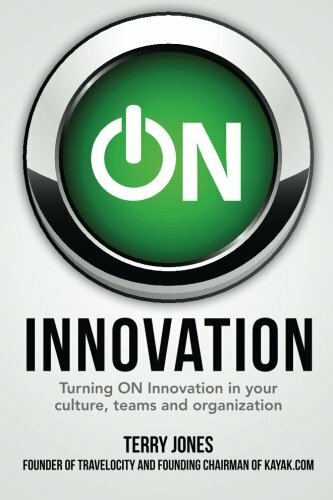 Terry Jones's book "On Innovation" is a gem. Countering a management tradition in which empty slogans too often take the place of actual thinking, Jones returns our attention to hard won insights learned from creating 10 startups and working for some of corporate America's best mentors, and he does so with a light hand and a wry sense of humor. You'll come away from this book enriched, even if you just only dip into it in 10 minute snatches now and again.